Councillor Michael Clarke is contesting the general election as an independent candidate in Sligo-North Leitrim. The Dromore-based publican and farmer was elected as a member of Sligo County Council in June 2009, topping the polls in the Dromore electoral area. 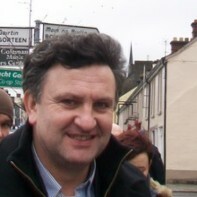 Clarke had previously stood as a Fianna Fáil candidate in the area in the local elections of 1991 and 1999. Clarke was sentenced to two years' imprisonment in 2002 for his role in an agricultural finance scam.